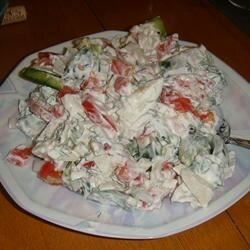 "A wonderful and easy Russian salad. Outstanding with Russian Stew." In a medium bowl, toss together sweet onions, tomatoes, and green bell peppers. Blend sour cream and dill in a small bowl. Lightly toss into the salad mixture. Cover, and chill in the refrigerator until serving. This was a great way to get rid of some tomatoes and peppers from the garden, but it needed a little something. It tasted better the next day after the flavors had time to blend. This is a simple and quick salad as well as being very tasty and great for summer eating! YUM! This was so good and light...the only thing that I changed was I added a tsp of chopped garlic...the only seasoning needed then was salt, pepper, and dill!